Using the 3.5mm audio jack the Portapack can also be used as a standard Push to Talk or voice activated walkie talkie radio. With a microphone plugged into the audio jack simply hold down the right button to push to talk. If required you can also enable multiple CTCSS tone options, as well as tones that look like they enable transmission to wireless headphones. 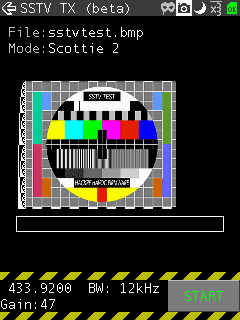 We also briefly tried transmitting with the SSTV feature and we were easily able to receive the transmitted image on a PC using an RTL-SDR and SSTV decoding software. Other ham modes available for transmitting include APRS and Morse code. There is also a generic OOK transmitter which can be programmed with custom data. This mode might be useful for experimenting with simple keyfobs, or things like home automatation switches. What might be disturbing to some is that there are also numerous transmit modes implemented that are illegal in most countries and could get you into huge trouble. One obvious one is the signal jammer. To test the jammer we connected the PortaPack to a dummy load to prevent the signal from travelling more than a few centimeters away, and placed an RTL-SDR with antenna nearby. 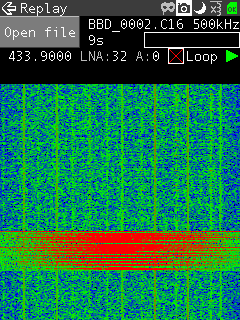 With that it was easy to see the jamming signal as shown in the image below. There are also more niche troubling transmitters implemented such as the NTTworks burger pager transmitter, which presumably activates some of those small pagers that you receive at some restaurants to tell you when the food is ready. There is also a Keyfob transmitter which looks like it might possibly be able to lock and unlock certain models of older flawed Subaru vehicles. Then there's a BHT Xy/EP transmitter which we think might be able to turn on and off street lights in some European countries, and the implementation of TEDI/LCR which is possibly used for French electronic street signs. Also troubling is the implementation of an ADS-B and POCSAG transmitter. If you are experimenting with the PortaPack and the aptly named 'Havoc' firmware be very careful not to activate these modes unless you have some legit purpose as they could indeed cause some serious trouble, possibly even landing you in jail. By connecting speakers to the Portapack's 3.5mm audio jack we were easily able to listen in on standard NFM and WFM audio signals. 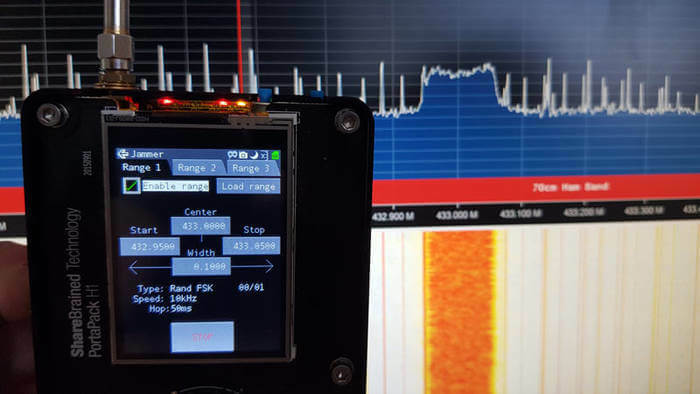 The displayed bandwidth is only as wide as the signals are, so it can be a bit hard to explore the frequency bands if you don't already known the frequencies, so we'd recommend having a frequency list handy first. Receiving WFM and NFM audio with the PortaPack. We also tested ADS-B reception with our ADS-B LNA. The bias tee on the HackRF can be easily enabled on the PortaPack by selecting the inductor and lightning symbol on the top right. With the bias tee enabled we were able to receive aircraft. The PortaPack is a very handy partner to the HackRF. It allows you to experiment with, record, listen, decode and transmit RF signals out in the field, without the need for any computer. You do need to be responsible and careful with the device though, as there is the huge potential of getting in trouble with it if you start transmitting illegal things. The biggest use that we see for the PortaPack is for testing capture and replay attacks, and perhaps for capturing IQ data out in the field, for later analysis back in the lab on a computer. 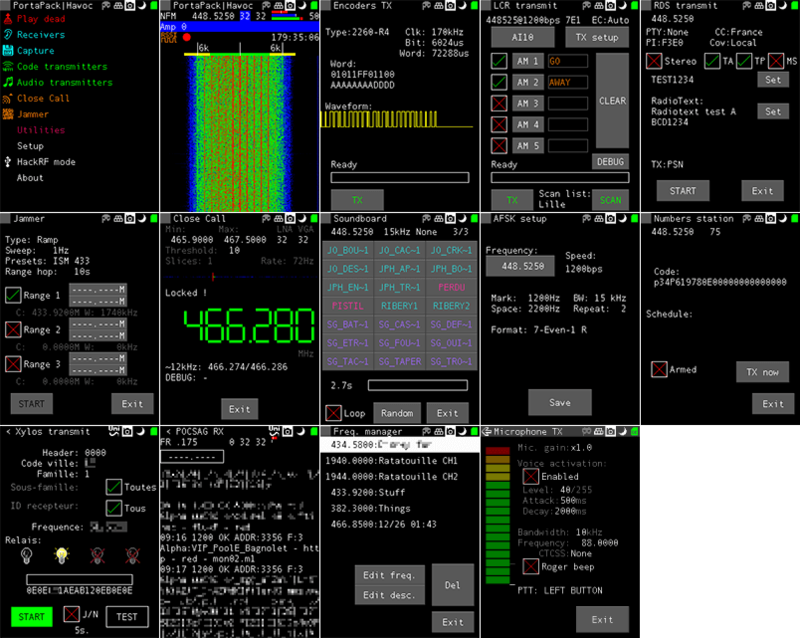 But many of the receivers and transmitters implemented can be fun to play around with too. Having issues building due to compiler incompatibilities. Can you post the firmware you used? Cheers. I got it compiling in the end. hi I bought a PortaPack last week and the LCD is not working, what do I do? Is this worth buying today? Hackrf is old hardware and portapack too. 700$ is not exactly cheap. I love the idea but will there be anything like this but new version? I have a Chinese HackRF & Portapack. Both work well. Noisefloor on the HackRF is roughly the same as my previous GreatScott unit. Occasional hangs when I go to Capture Mode on Havoc f/w. but that could be a firmware issue. Two years inside for building, owning or operating a mobile phone jammer in Australia, ouch. Although as a clean skin SDR geek you will probably get 6 month first offence. Exactly. I imagine most countries would have similar penalties. 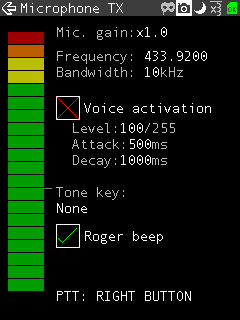 Backed HackRF on KS & love it. Is the PortaPack software available for use on other platforms so we can use it on a laptop, tablet or cell phone? @Siva_Tango_Delta – No, only runs on the little processor on the portapack I believe, not sure it can be cross-compiled due to the specific hardware used. March 29, 2018 - 6:13 pm Are you sure ? I’m about 99% sure that all the code runs on processor in the HackRF. Nope not 100% sure at all, doesn’t really change things IMO though. Let us know how it goes! March 29, 2018 - 10:59 pm Care to check again ? 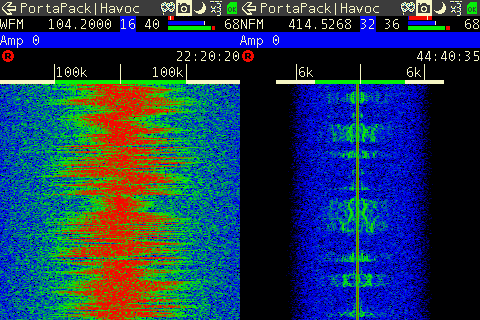 #hackrf: There’s no processor on the PortaPack H1, it’s all going on in the HackRF One’s LPC4320. The full GPL source code is available. > For use on other platforms so we can use it on a laptop, tablet or cell phone? Long answer: Your question is a lot like asking can the engines from a Saturn V rocket be installed on a pickup truck. The software is custom written and extremely optimized for one physical device, to modify that would require a massive amount of work and some crazy outside the box thinking. Even then not everything will function. There will be latency issues, with the CPU directly connected to the ADC/DAC latency is of the order of nanoseconds to microseconds (Port-a-pack). But accessing an SDR over USB 2.0 the latency is in the order of milliseconds, somethings will just never work with 1000 times the delay (two way protocol handshakes).